VOTE Tuesday (Articles 20-27), LOTS of Neighborhood News (Articles 1-9); TAX help (Articles 10-11); About the ENVIRONMENT (Articles 28-32); the CALENDAR (below). 9 - Calling All Musicians! Five people from the neighborhood attended the Fitchburg hearing about proposed changes to bus route 59 that serves the western part of the Dunn’s Marsh Neighborhood on weekends and holidays. Madison Metro Transit will hold another hearing about the proposed changes on Wednesday, April 9, 6:00 p.m., 215 Martin Luther King, Jr. Blvd., Room 260 (Madison Municipal Building). The change has the purpose of serving Fitchburg better with direct service to Orchard Pointe - Aldi’s, Target, HyVee - and the West Transfer Point on Tokay that is close to Copp’s and Westgate where another HyVee is located. In our neighborhood, the changed route would add stops on the upper part of Allied Drive while taking away stops on one side of Red Arrow Trail, the loop of Crescent to Lovell Lane, and one side of Lovell. The route would go only one way through the neighborhood. At its March meeting the DMNA Council went on record in support of the change, liking the more direct service to Target. The Council also asked for an additional stop in the vicinity of Crescent Road at Sentinel Pass to better serve the eastern side of the neighborhood. The proposed route would be the first Metro route to go down Seminole Highway: it would come down PD/McKee Road from the area at Target, cross Verona Road and continue past the Star Theatre, take a dip into the commercial area near Seminole, and then go north on Seminole, crossing PD and coming into the Dunn’s Marsh Neighborhood at Sentinel Pass. Look at the attachment to see the route. On the negative side, Fitchburg Alder Carol Poole said she was sure to get complaints about the noise of the bus on Crescent Road between Red Arrow Trail and Sentinel Pass. She also felt is was wasteful to have lengthy areas without stops as there would be on Seminole Highway. 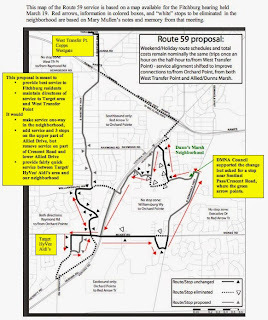 It may be important to know that many other route changes will also be dealt with at the hearing on April 9 including 8, 14, 15, 19, 26, 36, 44, 48, 50, 70, 71, 72, 73, 74, and 78. Although Route 59 serves a small portion of Madison on Allied Drive, all fares will be credited to Fitchburg. Fitchburg will pay for the service. Costs to Fitchburg will be similar to those at present time. Estimates are that ridership will increase by 30-50% due to the route change. Attending the Fitchburg hearing on March 19 were Thea Bach and Mary Mullen, representing the Dunnn’s Marsh Neighborhood Association, Fitchburg Alders Carol Poole and Dorothy Krause, and Belmar resident Cathy Casper. Interested in gardening in the Marlborough Park Community Garden? There may be a few plots left. Contact one of the people on the garden management committee. They will be assigning plots at their meeting on April 1. All live in the neighborhood. English speakers may contact one of the English-speaking garden management committee members. OK, so this is a trashy headline, but it did get your attention, didn’t it? After many years of consideration, CAC has decided to end its leadership role in community gardens in Madison and Dane County. While we thought we would be able to continue in our usual ways for 2014, changes in staff and other factors have moved the calendar up considerably. What that means is this: CAC’s major role in community gardens will end May 31, 2014. Here’s some history. CAC became somewhat involved in the Marlborough Park Community Garden around 2004, but took over completely from the Dunn’s Marsh Neighborhood Association in 2006. The verb “took over” is used intentionally because it was against the wishes of the DMNA to give up management of the garden. The DMNA had successfully managed our neighborhood’s community garden in Marlborough Park since the 1970s, for many years under the leadership of neighbor David Martin. At some point the City of Madison decided that all community gardens on city property should be managed in exactly the same way. In 2005 Bill Barker of the Madison Parks Commission asked to meet with neighborhood leaders and urged us to give up the DMNA garden lease with the city in favor of CAC. Negotiations followed. One thing DMNA leaders objected to was steeply graduated CAC rental fees for plots - $10/$35/$65 - when we were accustomed to charging (and paying) $9 per plot. But really there was nothing to be done because one condition of the lease was that it could be terminated at any time for any reason. What does CAC’s decision mean for the Marlborough Park Community Garden? First of all, our CAC garden specialist, Micah Kloppenburg, has promised to stay on as a volunteer with our garden even though he is no longer working for CAC. That’s great because he speaks Spanish and we need a translator. Over half the gardeners are Latino families. He’s also been helpful as a leader in many other ways. Secondly, registration should be completed by the May 31 date and the water should be turned on for the season. CAC will continue to hold the leases and insurance for the gardens until December 31, 2014. But plants, seeds, and other resources will have to be picked up rather than be delivered by CAC. Compost, mulch, and other amenities will also have to be coordinated differently. Finding someone to plow the tilled area of the garden may actually be the most difficult part for our garden. On the plus side, Our garden has a strong management committee. It has been meeting on a monthly basis all year long. Greta Hansen’s letter concluded with some hopeful notes. The process for determining a sustainable, gardener-driven community gardens program is continuing with a planning group made up of several community stakeholders, including garden leaders, community agencies, local government, and others. This group will be responsible for identifying potential gaps after May 31, 2014 suggesting how the City of Madison and/or other agencies may be able to fill those gaps. This group will also be studying and ultimately proposing a new model for a community-wide garden program with funding sources, and hopes to have a structure in place before the 2015 growing season. Fortunately, a working group of garden leaders formed at the City Garden Committee on March 25th will be meeting with you soon to regroup, rethink and reorganize your respective and collective roles. As the temperatures warm up, the athletic fields and parks turf is starting to thaw. We are all feeling the effects of this long winter and want to get outside and play; however, we need people to continue to stay off the grass and athletic fields during this early spring thaw. When games or practices are played on fields with poor or unsafe conditions - such as these early spring conditions, participants and spectators can be injured. Also, major damage to the fields can result. Afterwards, it can take months, or even years, for the fields to get back into quality playing condition. Madison Parks asks that team practices and pick-up games refrain from being played on the fields and parks until we give notice that it is safe to be on the fields. This will help minimize the damage to the turf. In April, weather permitting, the City of Fitchburg will be conducting prescribed burns at the park and natural areas listed below. The purpose of the burns is to promote native prairie vegetation and oak regeneration. Prescribed burns are an essential tool for restoring and maintaining prairie, oak savanna and oak woodland habitats. These habitat types have declined dramatically throughout Wisconsin since initial European settlement in the mid 1800s. Despite the rarity of these habitats, healthy prairies, oak savannas and woodlands support a disproportionate amount of biodiversity and harbor many regionally rare and declining species. The burns will be conducted by Adaptive Restoration LLC, the company the City has hired to care for its prairies and conservancy areas. Adaptive Restoration will provide City staff up to 24 hours advance notice of the burn, and they will notify all appropriate authorities prior to the burn. Their burn crew consists of trained firefighters with all the equipment necessary to keep the fire under control. In preparation for the burn, Adaptive Restoration will be mowing or cutting vegetation around the areas to be burned as necessary. These temporary paths will be used to contain the fire within the park. On the day of the burn, we ask that you avoid visiting the park until the burn is complete, so the burn crew may do their work safely and efficiently. The burn will be conducted on a day when weather conditions allow for a safe burn with minimal smoke impact on your neighborhood and local roads. However, we recommend keeping windows and doors closed to keep smoke or the smell of smoke out of your home. For more information, please contact Urban Forester Ed Bartell at 608-270-4289 or Mike Healy, Restoration Ecologist with Adaptive Restoration 608-554-0411. Prescribed Burns for April 2014 -- Burn sites are highlighted with purple or yellow outlines. Police coverage and road issues - those will be the subjects we will learn about from two special speakers at the April 10 meeting of the Dunn’s Marsh Neighborhood Council. Any and residents may attend the meeting which begins at 7 p.m. at Prairie UU Society, 2010 Whenona Drive. One speaker will be Lt.Michael Hanson from the Madison Police Department. The second will be Cole Buerge. He is consultant to WisDOT hired to gather input from people along the Beltline corridor. Now that the Verona Road project is well underway, the Wisconsin Department of Transportation is going on to plan what should be done about the Beltline. 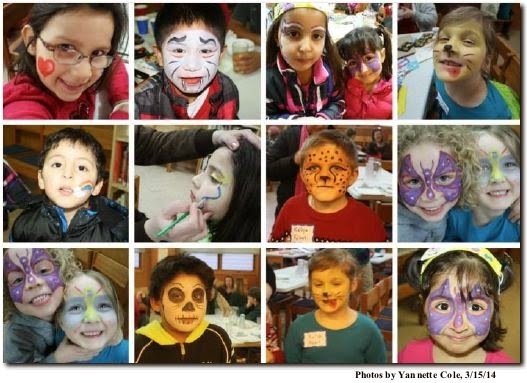 It was a madhouse of happy kids getting their faces painted or doing crafts while adults enjoyed five different delicious chilis and each others’ company. That was the Dunn’s Marsh Neighborhood Chili Fest held on Saturday, March 15. If you weren’t there, you missed a good time. You might say that the success of this event was primarily in the hands of the three Figueroa sisters. It was Heidi (Figueroa-Velez) who secured the $20 gift card from Woodmans that was the first prize that went to Andy Kraus for his chili. Heidi also brought tons of crafts for kids and got them going with coloring and making crowns for themselves. Those two sisters got their third sister Veronica (Figueroa Lazo) to do the face-painting. Veronica is a master painter as everyone could see as she proceeded to decorate all the kids’ faces. 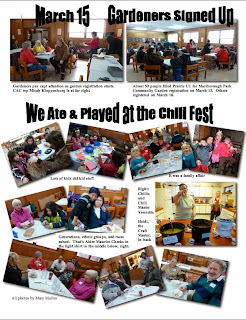 While these three were major organizers, it is only fair to say that every single person who came to the Chili Fest was in part responsible for the great time we all had. Thanks for making this a wonderful event. Jim Roloff, project manager for Bluestone Custom Homes, spoke to the DMNA Neighborhood Council at its March 13 meeting. Bluestone was selected by the City of Madison to build 25 single family homes in the undeveloped area of Lower Allied Drive. The new area will be called Mosaic Ridge. Roloff explained that much is being done to make the 2-,3- and 4-bedroom homes affordable. Some will be sold at below-market rates with help from the City. The lots normally go for $30,000-$35,000, but will be discounted by the city to help make the homes affordable. Market rate for these homes could be $180,000. Greenpath is working with first-time low-income potential owners to help them clean up their credit and learn how to care for a new home. Homes will range from 1,000-1,700 square feet. All will have basements and detached garages. All will be Energy Star homes which means they will be very efficient in the way they use and conserve energy. Other homes, along Equity Lane in the Renaissance development west of Red Arrow Trail, will be built by Habitat for Humanity. Can you play “Chopsticks” on the piano or “Mary Had a Little Lamb” on the violin? Have you participated in a school band or orchestra or taken up the guitar as an adult? Do you sing at karaoke events or in the shower? Or maybe you even get paid for playing music? Doesn’t matter. As long as you play or sing, you are WANTED for the second annual Make Music Madison event that is held all over the City of Madison on Saturday, June 21. In particular, if you live in the Dunn’s Marsh Neighborhood, we want you to perform FOR US. The DMNA and Prairie UU Society are again co-sponsoring Make Music Madison on the Prairie grounds on June 21. Make Music Madison is a live music event with music performed by anyone and enjoyed by everyone. Anyone, no matter what age or what level they’ve achieved is welcome to participate. Now is the time to sign up to perform and to start practicing. We’d love to have a bunch of kids show off their abilities as well as adults with any level of skill. The point is, you enjoy music and we want to hear it. For more information or to sign up, contact the point person for this in-the neighborhood event: Mary Mullen, 298-0843 or mmullen@chorus.net Even if you aren’t sure you want to perform because you never have done so, be brave and shake off those cold feet! Talk to your musical friends outside the neighborhood as well. You don’t have to live in the neighborhood to perform at the Prairie UU venue. Last year one of the most successful events sponsored by the Dunn’s Marsh Neighborhood Association was Make Music Madison. The 4-hour live music event drew 8 acts and over 60 people all at one time, more if you counted all those who came and went. · · $496 with no qualifying children. The credit is available in 2014 for a family with three children, earning up to $46,997 ($52,427 if married filing jointly). Families with two children can earn up to $43,756 ($49,186 if married filing jointly); and those with one qualifying child can earn up to $38,511 ($43,941 if married filing jointly). A household with no qualifying children is eligible to receive the credit if earned income does not exceed $14,590 ($20,020 if married filing jointly). "This tax benefit is designed specifically to help working families," said Soglin, "but too many taxpayers fail to claim their share." The U.S. Internal Revenue Service estimates that one in five eligible workers miss out on the credit each year simply because they do not ask for it. "The earned income credit is a key resource that can help working families make ends meet," said the Mayor. "But families don’t receive the credit if they don’t claim it, and they can’t claim it unless they file a tax return. Even people who have earned wages during the year but don’t owe taxes are eligible for the credit," he added. "But they must file a return." Soglin also noted that the value of the federal credit is enhanced for Wisconsin workers because the State provides an additional credit to workers with children. The State credit adds as much as $2,088 for a household with three or more children, up to $600 with two children and up to $132 for a household with one child. The State does not provide a credit for childless workers. The Mayor urged families who need help claiming the credit to make use of free tax preparation assistance. "Madison has a strong network of skilled organizations and volunteers who are able and willing to help." Soglin noted. Free tax assistance is available at the Richard Dilley Tax Center located in the Villager Mall, at 2300 South Park Street. This volunteer site, provided through a partnership between the Dane County UW-Extension Financial Education Center and AARP, is open every Monday, Wednesday, and Saturday through April 14 without appointment. Mondays and Wednesdays, the hours are noon-6 pm. Saturday hours are 9 am-3 pm. This help is for low income, elderly and/or people with disabilities. 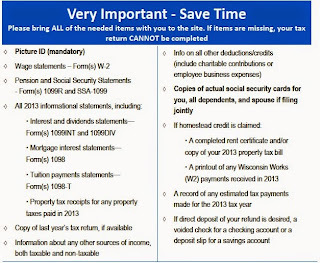 Help is also available from volunteers through Volunteer Income Tax Assistance (VITA) at sites throughout the City, including the Madison Senior Center, the Central Library, and several library branches. Make sure websites are secure before you turn over credit card information, advises the New Jersey Coalition for Financial Education. Look for a closed padlock symbol in the address bar of your browser to make sure it’s secure. The web address should also begin with https:// -- the extra “s” is for “Secure Socket Layers,” a protocol designed to keep your information safe. Keep your passwords secret (even from friends) and change them frequently. Avoid using personal information like your birthday as part of your password. Longer passwords are better, as well as those that use a combination of numbers and letters. Be wary of emails from trusted folks that ask you to “verify your account information” with personal information such as your Social Security number. Odds are, it’s someone phishing for vital info about your identity. Don’t click on those email links – call instead to make sure it’s a legit request. If you are EVER in doubt whether a person contacting you is really from your bank or credit union, take these important steps. In addition to recent reports from [Summit Credit Union] members that they have been contacted by people posing as [credit union] representatives and requesting account information, the National Credit Union Administration (NCUA) recently warned consumers to beware of a new telephone fraud in which criminals are using the NCUA’s name in an attempt to obtain personal financial information. Several Summit [Credit Union] members have been contacted by an automated phone call claiming to be from the NCUA and notifying consumers their debit cards have been compromised. The call then asks the receiver to follow prompts, which request personal information, including sensitive financial data and personal identification information. These calls are NOT from Summit Credit Union or NCUA. 1. Hang up immediately. Do not respond to or open any links in an email or text. 2. Call your credit union or bank immediately. Scammers may encourage you to call them back as a way to make you feel comfortable giving them information. Don’t fall for it. Hang up and call [your banking institution] directly. [The institution] can verify whether the caller was actually from the credit union or bank. And, if you did give any information away, early detection and response can be critical in minimizing damages. In these types of scam attempts, fraudsters do not even know you are a [credit union] member. They are hoping that by calling many people they can come across a consumer who has an account relationship with the financial institution they are pretending to represent. Remember, legitimate financial institutions will never contact you for information they already have—such as your account information, passwords debit card or credit card numbers —over the phone, by email or by text message. Never share personal information such as social security number, passwords, user IDs and financial information with anyone who phones, emails or sends you a text message, even if they appear to be legitimate or claim to be someone you know or do business with. Dane County and the City of Fitchburg have reached a tentative agreement to reconstruct a rough stretch of McKee Road/Highway PD in the City of Fitchburg. Pending review and approval by the Dane County Board of Supervisors and Fitchburg City Council, work on the more than $3 million project will begin this summer and be complete before next winter. In addition to replacing McKee Road/Highway PD between Seminole Highway and Fish Hatchery Road, the project will also include a drainage system under the road to move water away – the freezing and thawing of this water has caused heaving of the pavement the past two winters resulting in rough road conditions for motorists. Dane County and the City of Fitchburg will share in the capital construction costs of the project 50-50. 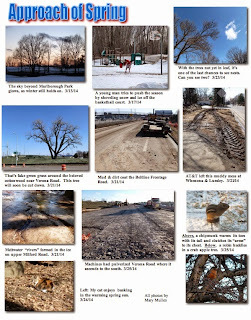 The agreement calls for the City of Fitchburg to begin snow removal on McKee Road/Highway PD between Verona Road and Fish Hatchery Road starting with the winter of 2016/17. The City will take on full maintenance of the road upon completion of the state’s reconstruction of Highway 18/151 – by January 1, 2020. “I am pleased to reach an agreement with the County to fix CTH PD in 2014. This demonstrates that collaboration still works for the betterment of the residents we represent.” Fitchburg Mayor Pfaff also applauded the efforts of Alder Pat Stern and County Board Supervisor Jenni Dye for their efforts on this important project that impacts both Fitchburg and Dane County. The agreement includes a couple of additional potential partnerships between Dane County and the City of Fitchburg – one that could dramatically improve safety for bicyclists crossing McKee Road/Highway PD. The City of Fitchburg is seeking a large federal grant to construct a tunnel for where the Badger State Trail intersects with the road. Should this multi-million federal grant come through, the county and city would split the local cost match so the tunnel could be built. Fitchburg Alder Patrick Stern was instrumental in helping to negotiate the eventual agreement between the county and city. “When I reached out to the Executive’s office, I knew that the most important thing was delivering results to constituents,” said Stern. “We all wanted that, and keeping everyone talking despite any differences is what ended up being the key to coming to a tentative agreement that worked for both Fitchburg and Dane County." County Supervisor Jenni Dye will introduce the tentative agreement to the County Board. Resolutions authorizing the tentative agreement will be introduced at the next meeting of the Dane County Board and Fitchburg Common Council, respectively. Keep your doors and windows locked, even while at home. Keep your garage door closed, and lock any door from the garage to the interior of your home. Keep the exterior of your home well illuminated; consider motion detecting lights as well. Leave interior lights on when you're gone; consider using a timer to turn them on and off. Also consider leaving a radio or TV on so it appears someone is home. Keep trees and shrubs near your home trimmed so that the exterior is visible. If you'll be away, take steps so it isn't obvious that you're gone: stop the mail and newspaper, have your driveway/sidewalk shoveled, keep your home illuminated using timers, etc. Get to know your neighbors, so you'll know what kind of activity is suspisious or unusual. Don't hesitate to call MPD if you see something suspicious. Don't leave keys concealed outside your residence. Keep a good inventory of your valuables, including serial numbers. This information can be a great help in case you are victimized. There you will see all the suggested categories. For example under Public Works are concerns such as a backed up sewer, a broken street light or traffic signal, park maintenance, potholes, sidewalk or gutter repait, street flooding or a water main break, and a few others. Police Department issues that are listed include abandoned bikes or vehicles, animal complaints, suspicious or nuisance activity, and traffic complaints. Once you click on one of the types of concerns, you will be asked to provide your e-mail address and a password. If you haven’t done this before, you will be asked to create a new account with your e-mail address, a password, and your name. Optional information is your address and phone number. The new system offers many advantages, including the ability to send text messages to your mobile device. In addition, each committee has a separate subscription, so you can subscribe to exactly what you want. Please join us on our new site, and sign up for those subscriptions that interest you. To unsubscribe from this list in the future, please send a message tp listserv@lists.city.fitchburg.wi.us with the words 'unsubscribe committees' in the message BODY. Do NOT send a message to the list itself. Q: Why did I receive more than one copy of this message? A: Because you are subscribed to multiple lists, you received multiple copies of the same message. Q. When will the old system be removed? A: The last message sent by the old system will be on April 18, 2014. Q. Why didn't you migrate all the current users to the new system? A. Because the new system offers many more options, including a separate list for each committee, migrating the current subscribers to the new system would almost certainly result in subscribers being added to more (or fewer) subscriptions than they would prefer. Q. How many more of these messages will I receive? A. You will receive three more messages regarding our transition to the new system, one each week for the next three weeks. Q. How can I unsubscribe from the old system so I no longer receive these messages? A. 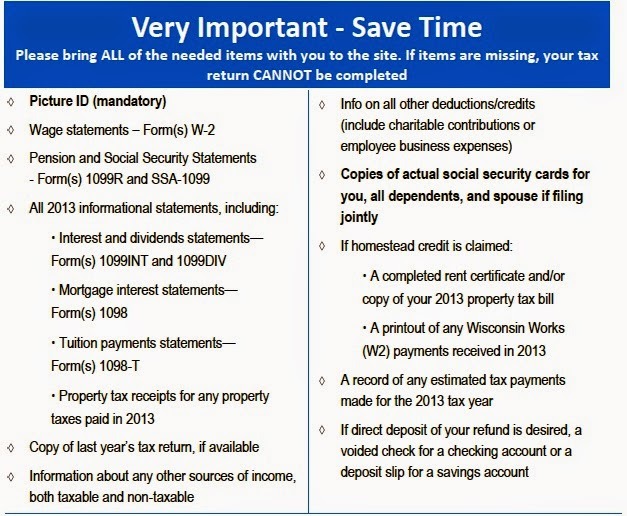 If you do nothing, you will stop receiving mail from this system after April 18, 2014. If you'd like to unsubscribe before then, go to http://64.73.46.101/mail_list/index.php You can unsubscribe by selecting the checkboxes, entering your e-mail address, and selecting "Unsubscribe" Again, if you do nothing, you will stop receiving messages by April 18. The Dane County Humane Society (DCHS) is offering a deeply discounted tag ($5) and microchip ($15) event April 21-22 and 24-27 at the shelter for both dogs and cats. Microchipping can also be done at the shelter on a walk-in basis any day during normal hours of operation or by appointment with your veterinarian. The shelter is located at 5132 Voges Road off Hy. 51 south of the Beltline. For more information, call 608-838-0413. Dane County Humane Society (DCHS) is pleased with the Common Council's decision Tuesday night to "file" proposed Ordinance Nos. 23.60 and 23.61. Had this legislation been enacted, the spay/neuter of pit bull type dogs would have been mandatory in the City of Madison. In choosing to file the ordinance, its proponents removed the legislation from consideration in favor of looking at alternative solutions to the problems identified. DCHS looks forward to working with the Common Council and all other stakeholders on this issue in an effort to provide positive solutions for the community and the animals affected. We also thank the community and our members for voicing their concerns with the proposed ordinance. No need to panic - although both the ballot and the tabulator (counting machine you slip your ballot into) will be slightly different from the past number of years, and Madison voters in the neighborhood will vote in a different - but nearby - building. Please note that voters do NOT have to provide ID, although voters must sign the voter book. It used to be that the voter had to fill in an arrow on the ballot. But that has changed. Now, to vote, fill in the oval to the left of the candidate’s name or the “Yes” or “No” of a referendum item. The important thing is to fill in the entire oval. It doesn’t matter if you go out of the lines. This is voting, not vying for an A in coloring. The new tabulators - counting machines - look rather like a computer screen on top of a garbage bin. The County bought them because of flooding in a storage area that ruined the old ones. As with the old tabulators, there’s a horizontal slot for your completed ballot. WAIT until you get the message “Thank you” printed on the screen. If you have made a mistake on your ballot such as voting for two candidates for the same office, the ballot will spit back out at you, and the screen will tell you where your “overvote” is. Ask for a new ballot. Unlike the old tabulators, the new ones will accept a blank ballot. Mark the oval next to your choice using a black or blue ballpoint pen. To cast write-in votes, mark the oval next to the write-in space, then print the candidate’s name. Insert your ballot into the DS200. Your ballot can be tabulated in any orientation (right side up, backward, or upside down). candidato en letra de imprenta. Inserte su voto en el dispositivo DS200. Su voto puede tabularse en cualquier orientación (con el lado correcto hacia arriba, desde el reverso o en posición invertida). de que su voto se ha escrutado. Madison voters in the Dunn’s Marsh Neighborhood will vote in a different building - the Dane County Parent Council building at 4709 Verona (frontage) Road. It is right at the corner of the Verona frontage road and Red Arrow Trail, just across Red Arrow from the MacDonald’s parking lot. This building is in front of the Head Start building where Madison voters cast their ballots for quite a few years. See the picture at the beginning of this election section. Fitchburg voters will continue to vote in the Fitchburg Fire Station #2, 5415 King James Way. Whether you live in Madison or Fitchburg, it won’t be difficult to get through the ballot at the polls on April 1. Why? Because all of the Court candidates are running unopposed, only one other race on each ballot has two candidates, and there are only two referenda (opinion) items. The main issue will be getting yourself to the polls sometime between 7 a.m. and 8 p.m.
All Dane Country voters will be asked to weigh in on referenda about legalizing marijuana and changing the way the state draws redistricting maps after each population census. Voters will choose “yes” or “no” for each question. The first question asks, “Should the Wisconsin Constitution be amended to require a nonpartisan system for redistricting legislative and congressional districts in the state?” Currently, the party in power usually dominates redistricting after each population census, and that party usually tries to change district lines to give party candidates an upper hand. The second question is, “Should the state government enact legislation legalizing marijuana?” The referendum is not binding, but if passed, it would show legislators what the majority of voters think. Read the next articles to learn about the contested elections. I think this is the first time two minority status candidates have run against each other for the Madison School Board. The two candidates for Seat 6 are Michael Flores and Wayne Strong. I’ve received mailings from both candidates. Flores is a firefighter/paramedic while Strong is a police officer. For County Supervisory District 27, the current supervisor Dorothy Krause is being challenged by Patrick Stern. Dorothy Krause is a one-term County Supervisor and a two-term Fitchburg Alder. She lives in the Dunn’s Marsh Neighborhoood. 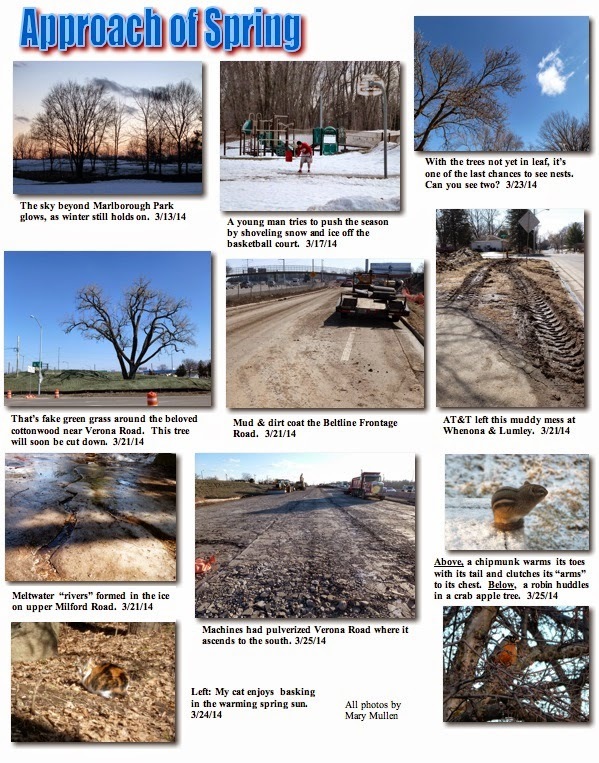 Patrick Stern is also a two-term Fitchburg Alder. He lives in the Seminole Hills subdivision of Fitchburg. See the complete sample ballot at http://www.city.fitchburg.wi.us/DocumentCenter/View/6618 The first ballot in the series is the one that Fitchburg voters from our neighborhood will see since the Fitchburg part of the neighborhood is in Ward 1. · View your voting history (please note that voting history is manually updated after each election, and this process takes several weeks to complete). Governor Scott Walker signed several elections-related bills into law on March 27. We want to emphasize that these new laws will not affect the 2014 Spring Election on April 1, 2014. The Governor will likely sign several other bills into law sometime after the election. The Governmental Accountability Board (G.A.B. ) Staff is working on a detailed summary of how each of these new laws will change election administration and how clerks, election inspectors, and the G.A.B. will implement these new laws. Again, it is important to emphasize that, because of their subject matter or their effective dates, none of these new laws will affect the 2014 Spring Election on April 1, 2014. Below is a brief summary of the general subject of each bill signed into law today. Assembly Bill 89 allows the governing body of municipalities with a population of 35,000 or more to combine election returns of wards with a population of 20 or less with an adjacent ward. Assembly Bill 396 changes requirements related to Special Voting Deputies. Assembly Bill 420 requires those who sign nomination papers or petitions to provide their legible printed name. This will be required of candidates for the fall elections. Assembly Bill 565 removes the elections calendar from Wisconsin Statutes. G.A.B. will continue to provide an elections calendar. Assembly Bill 606 lowers the nomination signature requirement for citywide aldermanic candidates in second and third class cities to between 100 and 200 electors. Senate Bill 20 changes the general requirement for election inspector residency to within the county rather than the ward. The law does not change requirements for chief inspectors or high school students. Senate Bill 324 limits the times for in-person absentee voting. The Governor issued a partial veto so that such voting may occur up to 55 hours during specified times on weekdays. Senate Bill 377 requires clerks to report statistics regarding EDR voter verification postcards. Senate Bill 548 transfers responsibility for mailing the voter list maintenance postcards from clerks to the G.A.B. As stated above, none of these new laws will affect the administration of the 2014 Spring Election on April 1, 2014. The Governor also signed Senate Bill 655, making various changes to campaign finance and lobbying laws. G.A.B. Staff is preparing a separate communication regarding some minor potential impacts this law may have for candidates and committees involved in the 2014 Spring Election. Reprinted from the Governmental Accountability Board website. There will be no fixed schedule for collection. Streets Division crews will begin collecting leaves & brush with Monday’s refuse collection districts. After completing collection in Monday’s areas, crews will move into Tuesday’s districts, then Wednesday’s districts, followed by the Thursday and then Friday refuse districts. Upon completion of Friday’s refuse districts, crews will begin the cycle again in Monday’s districts. 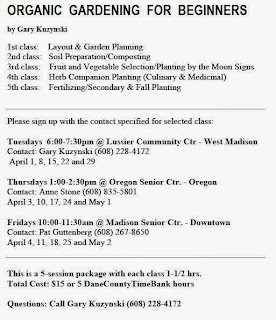 Starting early in April three sites will be offering classes in organic gardening for beginners. The cost for 5 sessions of 1 ½ hours each is $15, a measly $3 a class. 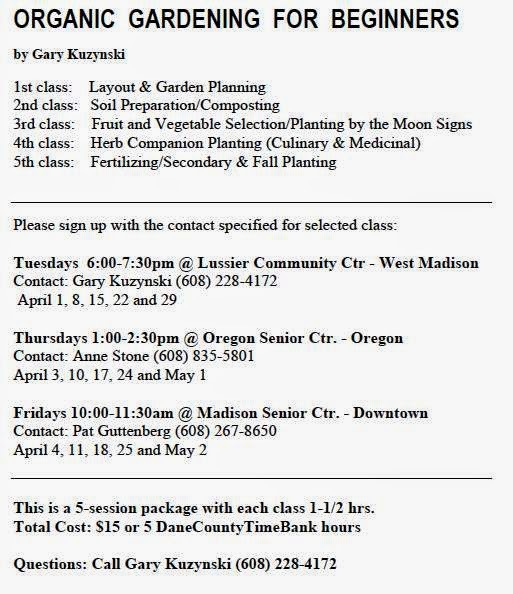 The three sites are the Lussier Community Center in west Madison, the Oregon Senior Center in Oregon, and the Madison Senior Center downtown. View the attachment for details of how to sign up. When: Thursday, April 10, 7 p.m. - 8:30 p.m.
Saturday, April 12, 9 a.m. - 10:30 a.m.
Urban Forestry staff will provide information to help homeowners, business owners, and other property owners with ash trees on their properties make informed, cost-effective decisions on treatment options for EAB. 1. Oil in storm inlets = Illicit Discharge? What’s That? - Fitchburg staff recently received an e-mail from a resident reporting of concerns with people changing oil in their cars and possibly dumping the oil down storm sewers draining into Dunn’s Marsh. Most people know this is illegal due to environmental concerns of oil contaminating downstream waterways, many know the citation is $250/violation, but only a few know who to contact if/when they see something like this. For areas within the Fitchburg City Limits, you can report illicit discharges to rick.eilertson@fitchburgwi.gov or 270-4264 or felipe.avila@fitchburgwi.gov or 270-4277. Please make note of the date, time, location, as well as any other details that can help Rick or Felipe follow-up to take appropriate administrative or enforcement action. For spills that need immediate response, you can also contact the DNR Spills Hotline at 1-800-943-0003 or visit http://dnr.wi.gov/topic/Spills/report.html <http://dnr.wi.gov/topic/Spills/report.html> . 2. City of Fitchburg Water Conservation Campaign Kick Off – Thursday, April 3rd, 6:30pm at the Fitchburg Public Library – The Mayor and Fitchburg Staff have made water conservation a top priority for 2014. Learn about existing groundwater supplies in Dane County, how to fix your toilet, and outdoor water wise landscaping. The event will be held at the City of Fitchburg Public Library and will feature speakers from the Wisconsin Geologic and Natural History Survey, Benjamin Plumbing, and the City of Fitchburg Department of Public Works. Check out FACTv (http://factv.city.fitchburg.wi.us/Cablecast/Public/Search.aspx?ChannelID=3&SimpleSearch=PSA <http://factv.city.fitchburg.wi.us/Cablecast/Public/Search.aspx?ChannelID=3&amp;SimpleSearch=PSA> <http://factv.city.fitchburg.wi.us/Cablecast/Public/Search.aspx?ChannelID=3&amp;SimpleSearch=PSA <http://factv.city.fitchburg.wi.us/Cablecast/Public/Search.aspx?ChannelID=3&amp;SimpleSearch=PSA> > ) for updated Water Conservation announcements from Mayor Pfaff! And don’t forget to sign up for the Mayor’s Water Conservation Challenge. Beginning April 1st you can pledge to conserve water in Fitchburg. Visit http://www.wylandfoundation.org/mywaterpledge/ <http://www.wylandfoundation.org/mywaterpledge/> for more details! 3. Tune Up your Bike for Spring – Saturday, April 5th, 2-4pm at the Fitchburg Public Library – Cycling enthusiasts (teens and adults) are invited to grab their bikes and come get their hands greasy. This free two-hour workshop will familiarize you with the different parts of your bike and how to perform simple fixes to prepare for a new riding season. This program is presented in collaboration with the Freewheel Community Bike Shop. 4. New Seed Library Available at the Fitchburg Public Library – The Fitchburg Public Library is participating in the Dane County Seed Library! Located on the 2nd floor of the library, near the gardening section, this new resource was made possible by the Madison Community Foundation and the John A. Johnson Fund. Check out seeds, take them home to plant, harvest at the end of the season, and return a portion of the seeds you harvest (by ~Sept. 1, 2014) to restock the seed library. For more details, please contact kate.hull@fitchburgwi.gov or 608-729-1763. · Sat., April 19th, 9am-Noon – Dunn’s Marsh Waterway Cleanup –Meet at Apache Pond, 4491 Crescent Rd. · Sun., April 27th, 1-3pm – Schumann Greenway Cleanup with All Saints Lutheran Church – Meet at McKee Farms Northwest Pond near the Splash Pad, 2930 Chapel Valley Rd. · Sat., May 3rd, 8:30am – 11:30am - Electronics Recycling Event for computers, monitors, etc. 6. 2014 State Trail Passes Now Available at Fitchburg City Hall – With special thanks to a new partnership between the City of Fitchburg and the Friends of Capital Springs Recreation Area, 2014 State Trail Passes are now available at Fitchburg City Hall from 7:30am-4:30pm Mondays through Fridays. 7. 2014 Bike Commuter Challenge Begins May 1st! – The National Bike Commuter Challenge (https://nationalbikechallenge.org/register) begins once again May 1 and will last through September. Stay tuned for more details on how you, your friends, your family and co-workers can participate in this summer long event! Do your part and help make Fitchburg a GOLD Bicycle Friendly City! Please note that Fitchburg’s web page is in the process of converting to a new format, which will include a new subscription mechanism to the mailing lists such as the “Fitchburg_Green” E-News. Please feel free to contact me if you have any questions, comments, and/or suggestions on future Green E-News topics. Spring is finally almost here and that means it’s time for the annual City of Madison Compost Bin And Rain Barrel Sale on Saturday, May 3rd at the Alliant Energy Center parking lot. New to this year’s event is a wider selection. This year’s event features a modern rain barrel equipped with a high-flow spigot and a diverter. Rain barrels as well as a sleeker designed compost bin are available in 3 different colors. The smallest rain barrels start at 50 gallons and the larger systems can hold 200 connect to just one downspout. Just ½ inch of rain on a 1000 square roof space produces 300 gallons of harvestable rainwater. Now in its 23rd year, Earth Focus Day Camp (EFDC) continues to create outstanding summer nature programs for children ages 3-14. With many different ecosystems, including the oldest restored tall grass prairie in the world, the Arboretum provides hands-on experience with native Wisconsin plants, animals and habitats. The research and restoration taking place here teaches children that they can be a positive influence on their world. Our naturalists are enthusiastic and experienced, but the real teacher at Earth Focus Day Camp is our most treasured resource, the land. Earth Focus Day Camp 2013 runs from June 14 through August 15. To go to the Earth Focus Day Camp website for detailed information and registration forms, click on http://uwarboretum.org/education/efdc/ Registration is due 2 weeks before a session begins.